A play review is one of the genres that is used for theatrical critique. The basis of any review is a critical analysis of a performance, movie, or art. The play review is more about evaluation of production than the text of the play. The reviewer should use acumen and balanced reflection to be able to give valuable feedback as a part of the audience. To write a good review, the author should watch the play and try to understand the director’s main idea that was transferred through staging, the actors, and musical accompaniment. A review is aimed to make an objective analysis of the performance and provide an opinion about the quality of the performance. Reviewers usually write about plays that no one has written about. As a rule, the play review has a dual purpose: it informs the readers to encourage them to attend the performance, and it evaluates it. The reviewer should make a judgment based on expectations and reality. Even theatrical lovers can’t attend every play, so these reviews help them deliberately decide on one or another play on their own. Who needs to know how to write a play review: high school, university, and college students, as well as journalists and those who simply strive to develop their writing skills. To be ready to write a good play review, you need to consider the list of activities that you should do. Read the play. Imagine how the production of the play may look, and think about the costumes, decorations, lighting, and overall atmosphere. Mention critical moments that will be especially interesting to see in production. This will help you find similarities and differences between the production and your expectations. Find out some background information about the history of the creation of the play. Don’t read reviews on the play by other authors hoping to know more about the play. A review from another person can influence your own impressions and may guide you in another direction. Buy tickets to a performance. Choose a place with a good view of the scene. Don’t be late. The lateness can distort your impressions and it is just impolite towards the actors. Take a notebook with you to the play and write down the most interesting moments, speeches, and impressions that you can include in your review. Write down everything: the best speeches, the most impressive moments, associations, thoughts, and insights. Half of the success of your review depends on these notes. If it is possible, organize a small meeting with the play’s director. Ask him or her some questions about the performance and compare the director’s vision with your own impressions. Also, clarify all moments that you haven’t understood. So, you have returned home with messy feelings and a notebook filled with scrawls. Right after the play, look through your notes to make everything clear. You could have forgotten to record something or you may find out that you can’t understand what you have written. Don’t hurry to write the review. It will be better to start writing the first draft on the next day of the performance. In such a way you will be able to compare your first impression and aftertaste. Learn theatrical vocabulary. While writing, you should pay attention to the right use of terminology. Basic description of the work. Who? What? Where? How? Evaluation of the actors’ work. Evaluation of the design (the set, costumes and makeup, sound, choreography, special effects). Evaluation of the direction and style. Reaction to the whole play. The following list of questions may seem simple, but giving the answers will help you stay focused on key aspects that determine the success of the performance. Also, the list will save your time and help you gain a fresh perspective on writing a play review. When you finish answering the questions, you will have a good base for your first draft. Is the play a premier? How many times has it already been staged? In what theaters can you see this play? What is the difference between these performances? What is the name of the theater? What kind of plays can you see there? Who is the director? What plays has he or she already staged? Does this play fall beside the common repertoire? What’s so special about this performance? Does the original plot of the play differ from the performance? What was the atmosphere during the play? Have you enjoyed the musical arrangement? What is the professional level of the actors (amateur, students, professional actors)? Have you enjoyed the actors’ performances? How have the actors delivered their roles? Were their gestures and movements believable? What actor performed the best? How have they used gestures? Were the costumes original? Why has the director chosen such costumes? Is the story current for today? Have you mentioned any special effects? Have you understood the language of the play? Was the story clear for you? Has the director cut any significant moments from the original play? Do you think the director has paid too much attention to certain passages? Why were certain colors chosen for the decorations? How has the lighting affected the play? Has the play worked as a whole? Have you mentioned episodes that seemed incomplete? 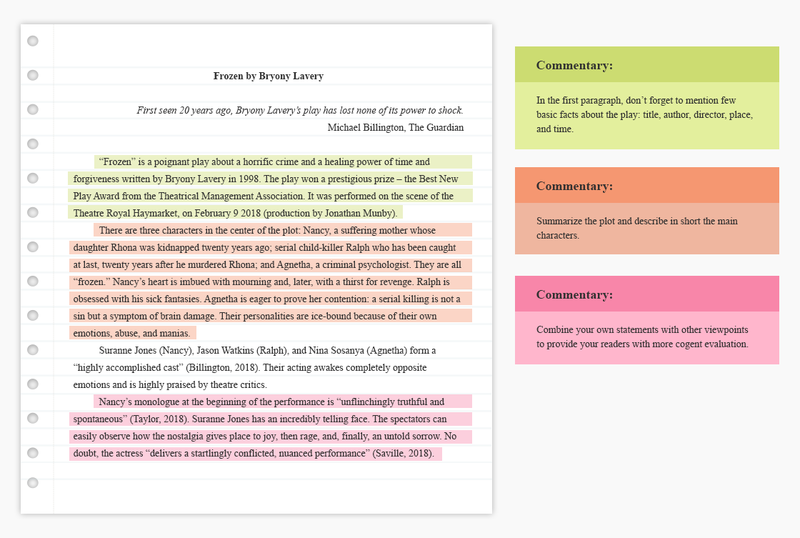 A play review can be written in the following formats: an article, an essay, and an extensive summary. The following advice on how to write a play review is general and can be applied to any type of play review. Step 1. Start your review with an attention grabber that will make the reader believe that your review is worth reading. Then, write the description of the play: the title, director, theater, year of staging, and author of the play. Describe your general impressions about the play based on your ideas of how good the play looks. Mention at least one or two issues the play has or has not addressed. Step 2. If you know some information about the theater building, it will be worth briefly mentioning. Tell the history of the creation of the play (especially if it’s a classical work and has been staged in this theater for years). Also, say a few words about the play’s author and director. Point out whether this play is common or uncommon for the director’s repertoire. If you have already seen other works of this director, you can compare them to the current play. Step 3. Describe the plot, but don’t fall into detailed description. Keep in mind that all presented information will serve as evidence to the next parts of the review. Step 4. Evaluate the performance of the actors. When listing the names of characters, don’t forget to mention the actors’ names. There is no need to list all the characters and evaluate them. Choose only those who have played a significant role or just surprised you. Step 5. Evaluate the play’s design. Tell about the scenic design and whether it clearly created the play’s mood. Discuss the work of the costume designer and make-up artist. Tell how certain costumes influence the overall perception of the performance. Evaluate the sound effects and the work of the sound designer or composer. Also, in this paragraph you can discuss the work of choreographers and other special effects that were presented during the play. Step 6. Write the analysis of the directing and style. Don’t forget to mention the director’s name at the beginning of this paragraph. Think about the idea the director tried to deliver to the audience. Analyze several episodes and describe the original director’s decisions. Pick several important episodes and evaluate their quality. Tell if you found that something was missing or there were confusing moments. A good play should be clear and understandable for the audience. Step 7. As a conclusion, describe the significance of your response based on the information from the previous paragraphs. Don’t disclose any new information, but it will be good to leave the reader with food for thought. Tell about an epiphany that you had during or after the play. Share your feelings and tell people why they should see this performance. Hopefully this step-by-step guide will ease your writing process, but without our ‘how to write a play review’ example you won’t see a complete picture. With the help of good play review examples, you can improve the quality of your own review. Mention what phrases and approaches the author uses to describe the performance and the way the analysis is delivered. 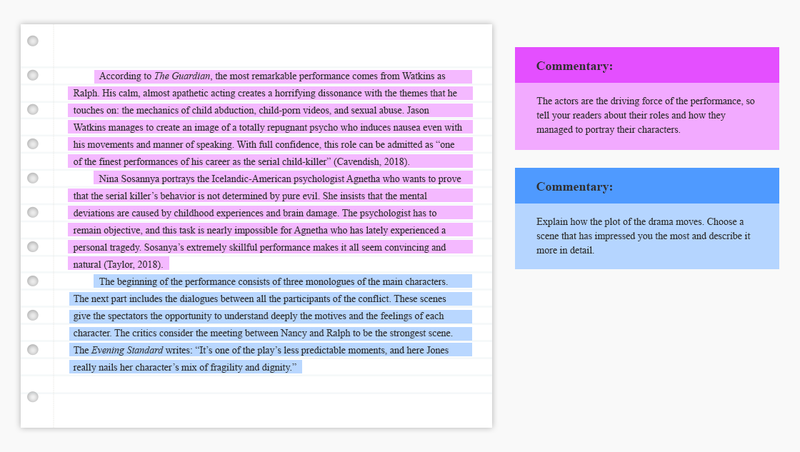 The theatre play review example contains all necessary parts of a good review and is worth reading when you don’t know how the complete review should look. Read the text from the picture below and pay attention to the expert’s comments. If this will not be enough, read other play review samples on our site. Before starting to write the review, make sure that you have understood the main aim of the review. It may be an advertisement, comparison of two plays, critique, etc. Don’t talk too much about the plot. Plot summary is a necessary evil that should be kept to a minimum. Pick only the most interesting moments to make the reader want to see this play. Don’t say “I like” or “I dislike” without giving arguments for your position. If you are going to talk about discoveries or innovations that you have mentioned in the play, make sure that no one has used this before. Stay objective and don’t allow your emotions dominate in your review, even if you haven’t enjoyed the play. If the play was created on the basis of classical literary work, tell about the new vision. Don’t forget that a theatrical performance is a result of teamwork: the director, light artist, composer, costumier, actors, and makeup artist. Don’t use general phrases that can be applied to any play. It should be obvious that you are writing about a certain play with all its unique peculiarities. Make sure that you have correctly written the names of actors and characters. A review is more than just an analysis – it’s a product of your creativity. Always remember that all of our advice is only a recommendation and only you can decide how your play review will look. To deliver a good play review, you need to love the theater and carry those feelings into your writing to inspire people to go to the theater. Our guide on how to write a music review also will be helpful.